Home, garden ads in Bunbury. Thank you for visiting our free advertising website Home, garden, Bunbury section. We provide high response free classifieds and free advertisement. Use our online free Home, garden classifieds placement system to find, list, offer Home, garden online! This is a 40 litre capacity stainless steel laundry trough. It is second hand but in very good condition. Would be ideal to install in a workshop or garden shed..
Simpson 5kg top loader washing machine in very good condition. Only selling because it's surplus to needs due to moving back to Perth.. This Panasonic Convection/Microwave Oven is as new, use it for everything. Selling because it won't fit in our new kitchen. Convection is fan forced oven; bake cakes, roast dinners, use as regular oven. You can also use combination, microwave & convection or just microwave. Fabulous oven. I have used one like this for over 20 years. Ryobi 2400w electric shredder/mulcher. Works well. GATE, 2180 wide x 1500 h. Near new. Has new hinges, plus latch & bottom stopper. Cream in colour, no side posts. $100 take away.. Tea chest and all assorted size packing boxes Over 100 in very good condition..
Colour " Caulfield Green" As new, never been erected. 4.76m/L x 3.12m.W x 1.9m/H ( 15 feet x 10 feet x 6.3 feet ) Gable roof, double doors. 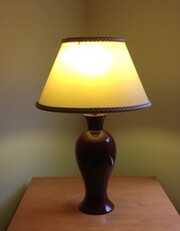 $1, 100.00 ONO PHONE ...0419 94 22 92 Please leave message and phone number if unattended ..
Burgundy table lamp with shade in very good condition, total height lamp and shade 63cm..
New 58 metres of Black Aquapol poly pipe 40mm (1 1/2"). All rolled up ready to go straight in trailer or back of ute. Will deliver if local. 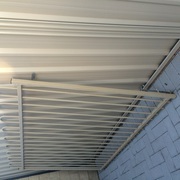 $113 New ........... WILL SELL FOR $70 Call Pete or Robbie 0428 600 455. 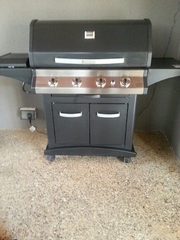 4 burner gas bbq with side wok burner, vegetable rack inside. Powder coated steel trolley with 2 door cabinet to store gas bottle and bbq accessories. Roll back hood with temperature gauge. One grill plate and a solid plate. BBQ cover included. In excellent condition.. In good working condition and appearance for holiday home. Price negotiable to conditiion. Phone: 97202286.
am selling a ride on lawn mower needs a bit of work done to it it is a hasavana. Four stroke Rover lawn mower with catcher. Good condition $150. Please call 0403 508 199 to arrange inspection..
Two stroke lawn edger. good condition. Please phone 0403 508 199 to arrange inspection..
Four stroke. Good condition. $150 please call 0403 508 199 if you would like to inspect..
Victa Tornado Edge 2 Stroke lawn mower with catcher.4 blades. Mulch & catch. Very good condition. $150 Please call 0403 508 199 if you would like to have a look..
For sale jarrah look floating floor 30 square metres. Excellent condition make an offer. Window 1: 3.4 m, window 2: 2.4 m. Sliding door 2.4 m. Pelmets and tracks included. $600 ono. Phone 0418 696 893..
For sale modular shower corner unit 1200x900 white with six jets, shower head, over head shower head, radio, fan and telephone function. Awesome unit..
Kirby Upright G5 Vacum cleaner. Very powerful and efficent, can be used either upright or as a straight suction cleaner. There are many attachments included and optional accessories are also available. The machine has had regular services and is in top condition. These machine are over $4000.to purchase new. Saeco Magic Deluxe coffee machine, used a dozen times, have purchased Pod machine. In great condition Asking $200. Plants for sale Indoor , outdoor, hanging baskets and succulents. Loads of different varieties Prices starting from $2.00 Make great xmas presents Ph 0427542138. Plant stands, 3 different styles to choose from, $30 each of all 3 for $ 80 the lot. MIDEA UPRIGHT FREEZER, 4 DRAWERS, 2 SHELVES, 185LTR, 3 YRS OLD APPROX, VGC. Everdure Ashburton, S/Steel/Black, wok cooker, spit, Heavy Duty cover paid $1, 600. very good condition, $650 ONO. Alroh Residential Reel Lawnmower Honda motor GC160 20inch cutting. Near new only used a dozen times. Ph 97218105 or 0414562422..
Renovating bathroom. Shower to go, still being used and needs to be removed. Has fan, lights, radio etc. You remove and price negotiated. Would be great in shed or like..
4 stroke rotary $150. 14" Victa reel mower $150. Push mower, Cutwell, $25. Edger, 4 stroke, Briggs & Stratton, $100 All in good condition. Phone Ray 0403508199. Australia free ads for Home, garden, Bunbury, Home, garden free ads Bunbury, Home, garden for sale Bunbury, Home, garden to buy in Bunbury. Find on this page free classifieds for Home, garden in Bunbury. This listing includes classifieds for sale and to buy in Bunbury. FREEADSAustralia Bunbury offers you a platform to post free advertisements or classifieds for Home, garden in Bunbury. FREEADSAustralia helps you search, find buy, sell, rent or hire in various categories like apartments, goods for sale, local services, cars , jobs and many more in Bunbury. If you posted an advertisement in category Home, garden of FREEADSAustralia Bunbury before please use Edit my ads button to change or cancel your ad. Home, garden Bunbury ads Bunbury, Home, garden classifieds Bunbury, Home, garden free ads Bunbury, ads for sale Bunbury, ads to buy Bunbury, FREEADSAustralia. Find here ads for sale, to buy and rent in Bunbury. Goods for sale in Bunbury, vehicles for sale in Bunbury, Bunbury real estate for sale, Bunbury property for sale, property for rent in Bunbury, business ads in Bunbury, Bunbury business classifieds, services in Bunbury, Bunbury services ads, jobs in Bunbury, pets for sale in Bunbury, Bunbury dating, Bunbury cars for sale.